All pictures Copyright 2001, 2002, 2003 Michael A. Covington. Contact me for reprint rights and higher-resolution scans. 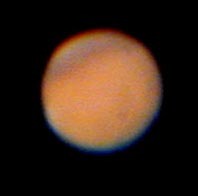 Mars, imaged with an Olympus C-2020Z digital camera aimed into a 9-mm eyepiece on an 8-inch f/10 telescope. South up; west to left. Central meridian about 180 degrees. South polar cap at upper left, with Mare Cimmerium and Mare Sirenum below it. Stymphalius Lacus visible as a spot to lower right of center. Dark area at lower right is Utopia Planitia. The asteroid 1999 KW4 making a close pass to the Earth, 2001 May 26. This asteroid came within 0.032 AU (3 million miles) and its apparent motion exceeded one degree per hour. Its brightness was still only magnitude 10.5 or so. This is a multiple exposure with an SBIG STV in track-and-accumulate mode. The jagged trail is due to the camera, not the asteroid, whose actual motion was smooth. There was a pause after the first of 8 exposures; that indicates which end of the trail is the beginning. The other objects in the picture are stars. Taken from my home in Athens, Georgia. Globular cluster M13 in Hercules. 8-inch telescope with f/5.6 compressor, 15-minute exposure on Kodak Elite Chrome 200 film autoguided with STV CCD camera. From my home in Athens, Georgia. The quasar 3C273, apparently one of the most distant objects viewable by amateurs, is in the very center of this picture. It is around magnitude 12.5 and varies irregularly. Next to it is a star of magnitude 13.5. The third star in the central triangle is magnitude 14.9. SBIG STV CCD camera, 8-inch telescope with f/5.6 compressor. Combination of four 30-second exposures in track-and-accumulate mode, from my home in Athens, Georgia, under light-polluted skies. The variability of 3C273 can usefully be observed by amateurs with 8-inch and larger telescopes. Charts are available from the AAVSO. 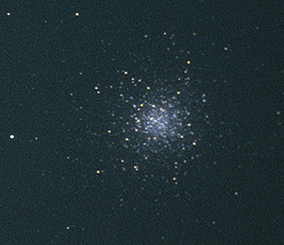 Globular cluster M13 in Hercules. SBIG STV CCD camera, 8-inch telescope with f/5.6 compressor, combination of three 15-second exposures in track-and-accumulate mode. This picture shows the uneven nature of the globular cluster that is usually lost on photographs. The stars are arranged into streams and there seem to be a couple of dark lanes in front of the central part of the cluster. Solar eclipse, Christmas Day, 2000. Celestron 5 telescope with Baader visual filter and Nikon F3 camera. 1/2000-second exposure on Kodak Elite Chrome 200 pushed 1 stop. 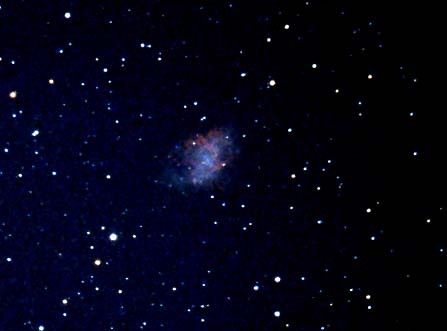 The Crab Nebula (M1). 8-inch telescope with f/5.6 compressor; 15-minute exposure on Kodak Elite Chrome 200 pushed 1 stop, autoguided with SBIG STV. Digitally processed image, a small segment of the original slide. Taken from my home in Athens, Georgia. The original showed appreciable sky fog. 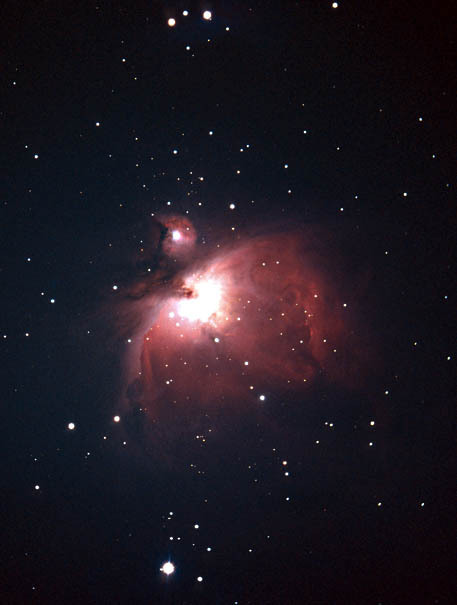 The Orion Nebula (M42 and M43). 8-inch Meade LX200 telescope with f/6.3 compressor. Five-minute exposure on Kodak Elite Chrome 200 pushed 1 stop. Autoguided with an SBIG STV CCD camera in an Orion Deluxe Off-Axis Guider (plus an extension tube just in front of the camera, so that the whole thing would reach focus). Taken at my home in Athens, Georgia. Digitally processed. The Hyades and Pleiades form a compact group with Jupiter (the brightest object) and Saturn, November 27, 2000. 90-second exposure with 90-mm f/2.8 lens and 1B and didymium ("intensifier") filters; camera piggybacked on telescope. Kodak Elite Chrome 200 film. Test of an IDAS (formerly Tokai) Light Pollution Suppression Filter.. Unlike conventional nebula filters, this filter preserves natural colors while cutting the emissions from streetlights. It is especially useful at suburban sites where light pollution is relatively mild and the drastic red coloration of a conventional filter is not wanted. 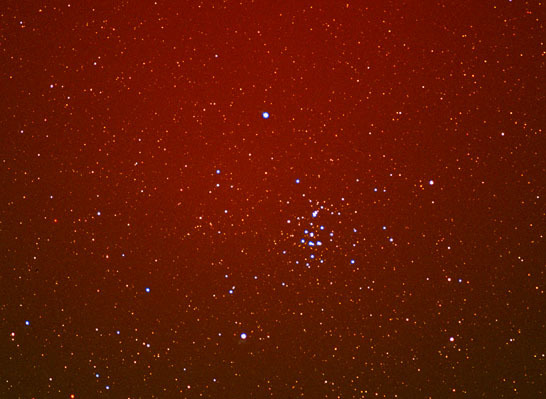 Left: 1B filter only, 1-minute exposure; right: 1B and IDAS filters, 3-minute exposure. Kodak Elite Chrome 200, 90-mm f/2.8 lens piggybacked on telescope. A small part of the picture is enlarged here; both images were given identical processing (sharpening and level adjustment). A cheaper alternative is to use a didymium filter. Taken at my home in Athens, Georgia. There appears to have been some internal reflection in the second picture; some of the brightest stars are accompanied by a faint secondary image to the lower right. I thank Mark Pippin for pointing this out. It presumably results from using two filters together. Janssen, a large walled plain on the moon. This was taken on my first night out with a new SBIG STV camera under rather poor conditions (unsteady air). 8-inch Schmidt-Cassegrain telescope, prime focus. An Iridium communications satellite glints in the sun and makes a bright streak in the sky. 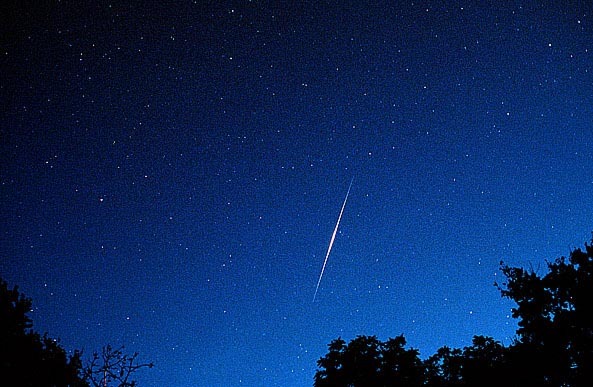 This phenomenon is called an Iridium flare and is much slower than a meteor. 10-second exposure on Ektachrome Elite II 100 film using a camera with a 50-mm lens at f/2.8 on a fixed tripod. The gibbous moon. 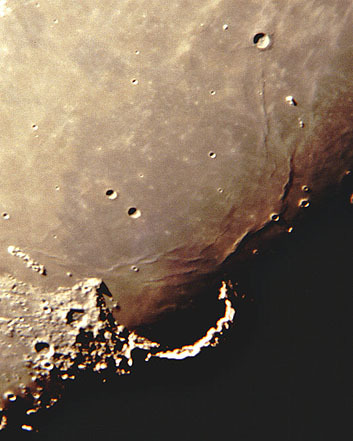 Aristarchus (arrow) is the brightest crater and has unusual reflective properties. 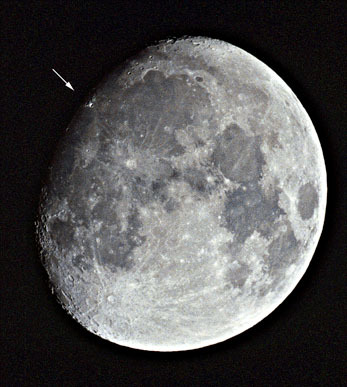 Transient lunar phenomena are often reported there. 1/60 second on Kodak E200 Professional Film at the prime focus of an 8-inch f/10 Schmidt-Cassegrain telescope. Digitally sharpened. 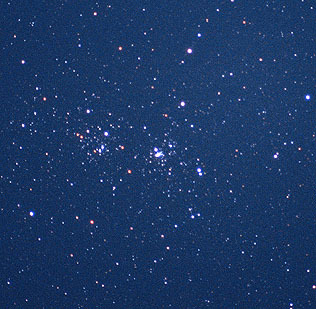 The Double Cluster, NGC 869 and 884, in Perseus. 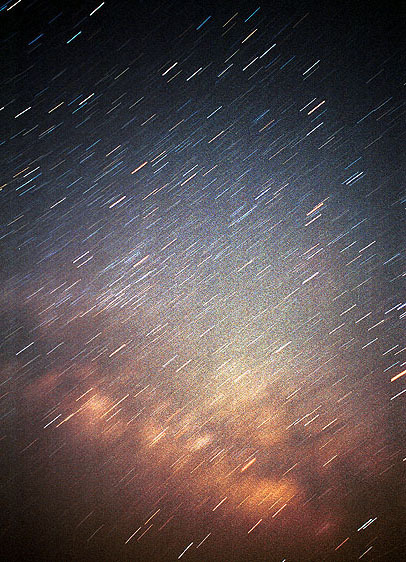 Five-minute exposure on Kodak E200 Professional Film with an Olympus 300-mm f/4.5 lens; camera piggy-backed on motor-driven telescope. Note how E200 film brings out the contrast between hot stars (blue-white) and cooler stars (reddish). 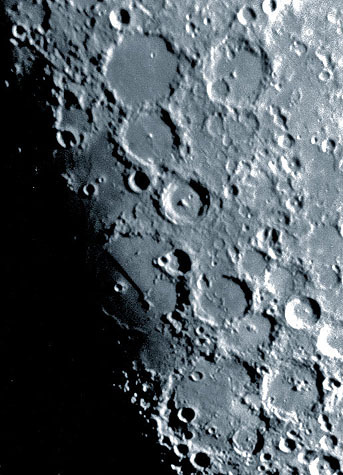 Mare Orientale, a ringed impact basin at the edge of the visible face of the moon. 8-inch f/10 Schmidt-Cassegrain telescope with Spiratone 3x teleconverter and Olympus OM-2S camera. Ektachrome Elite II 100 film, brief "hat trick" exposure. The Milky Way in violent motion -- actually, the motion is the earth's gradual rotation during the exposure, which lasted about five minutes. Olympus OM-1N camera with Zuiko 24-mm f/2.8 lens, Kodak Supra 400 print film, fixed tripod. Digitally enhanced print. Taken at the Charlie Elliott Wildlife Center, Mansfield, Georgia, by my wife, Melody Covington, as part of a search for meteors. Globular star cluster Omega Centauri. This is an enlarged scan of a 3x3-mm area of the original color slide, a 5-minute exposure on Fuji Provia 100F film with a Nikon F3 camera and Nikon 180-mm f/2.8 ED IF AF lens piggy-backed on a telescope to track the earth's rotation. 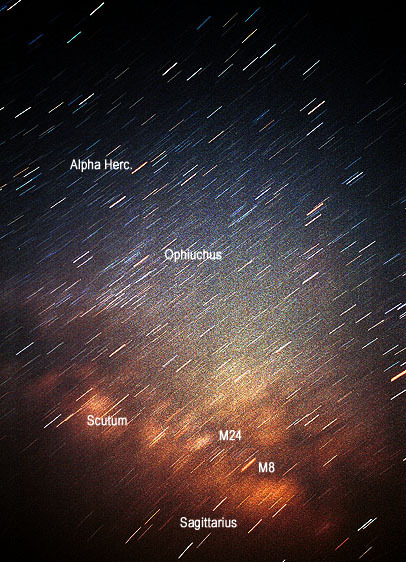 The extreme sharpness of the lens and the grainlessness of the film resulted in a high-quality picture showing 14th-magnitude stars. Taken at the Charlie Elliott Wildlife Center, Mansfield, Georgia. Effect of a didymium glass ("Hoya Color Intensifier") filter in cutting light pollution from sodium-vapor streetlights. This filter blocks the strong emission line of sodium. 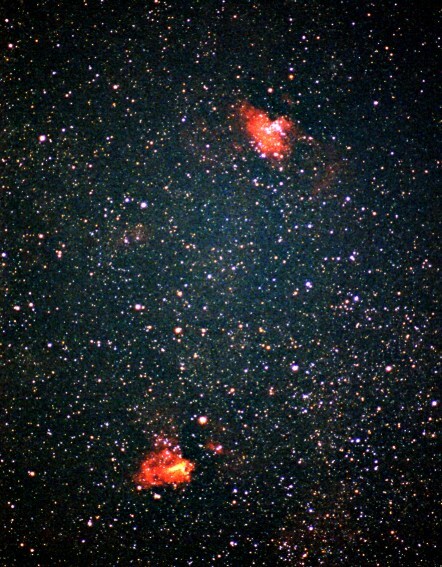 Nebulae M16 and M17 without and with the filter; each is a 2-minute exposure with a 180-mm f/2.8 lens on Kodak E200 film; camera was mounted piggy-back on a telescope to track the earth's rotation. Taken at my home in Athens, Georgia, where the naked-eye magnitude limit was about 5.0 to 5.5. 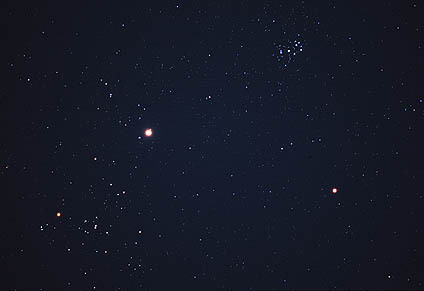 Star cluster M44 with a red background caused by the aurora borealis (Northern Lights), a very rare sight in Georgia, where I took this picture. This was the famous aurora of April 6, 2000, seen all over the South. Kodak Elite Chrome 100 pushed 1 stop, 180-mm f/2.8 lens wide open with 1B and 2E filters, 5-minute exposure with camera piggy-backed on motor-driven telescope. This is a better scan than was previously exhibited here. Earlier, I used a Minolta QuickScan 35 Plus scanner and got a streaky picture. This one was done with a Nikon Coolscan III. 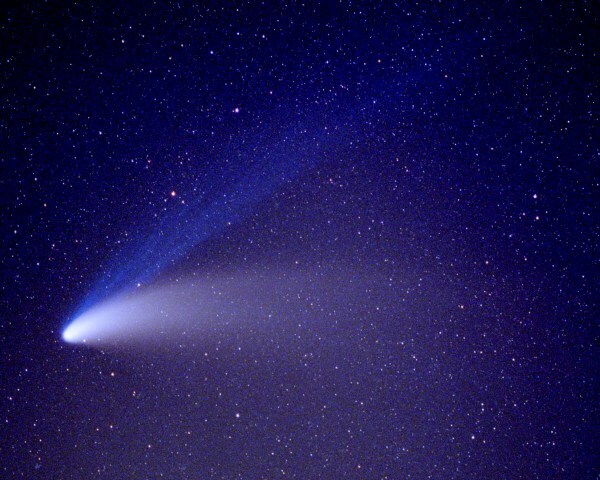 Comet Hale-Bopp. 3-minute exposure on Kodak Ektachrome Elite II 100 pushed 1 stop, with an Olympus OM-1 and 100mm f/2.8 lens wide open, using a hand-operated barn-door tracker to compensate for the earth's motion. Taken in Jackson County, Georgia. 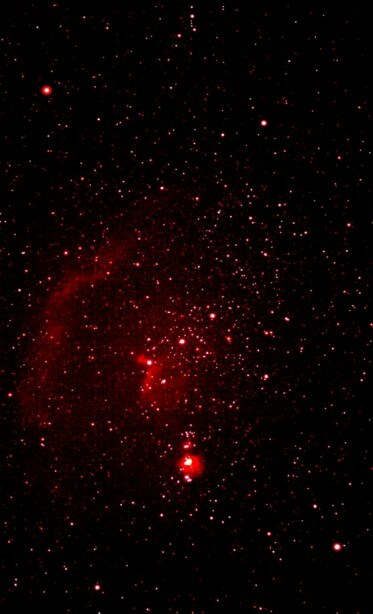 The constellation Orion, showing nebulae emitting deep red hydrogen-alpha light. Six-minute exposure on Kodak Elite Chrome 200 with broadband nebula filter, 90-mm lens at f/2.8, camera riding "piggy-back" on motor-driven telescope. 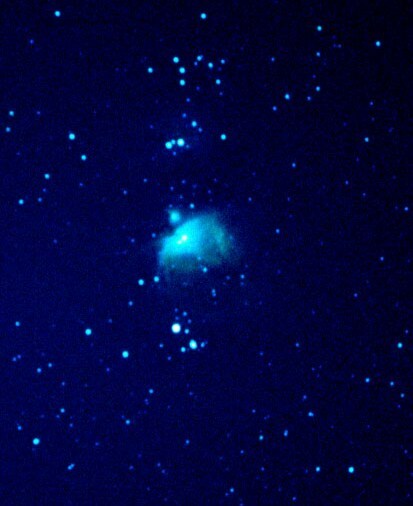 The Orion Nebula on infrared film, specifically Infrared Ektachrome. Only the green- and red-sensitive (blue- and green-imaging) layers of the film responded substantially. 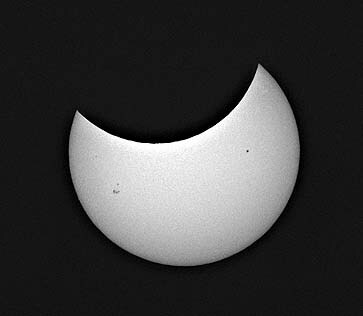 11-minute exposure, 180-mm f/2.8 lens wide open with #8 yellow filter, camera mounted on motor-drive telescope. This is a disappointing picture, but I always wondered what it would look like, and now I know. Nebulae M16 and M17 in Sagittarius. Kodak Elite Chrome 200, 6-minute exposure with 300-mm f/4.5 lens wide open, camera mounted on telescope. Because of city lights, this slide had a medium blue background until I processed it digitally. The summer Milky Way. For this picture I went out in the country and exposed for 4 minutes on Kodak Elite Chrome 200 using a 50-mm lens at f/2.8, with the camera mounted on a hand-driven barn-door tracker. Taken in eastern Clarke County, Georgia. 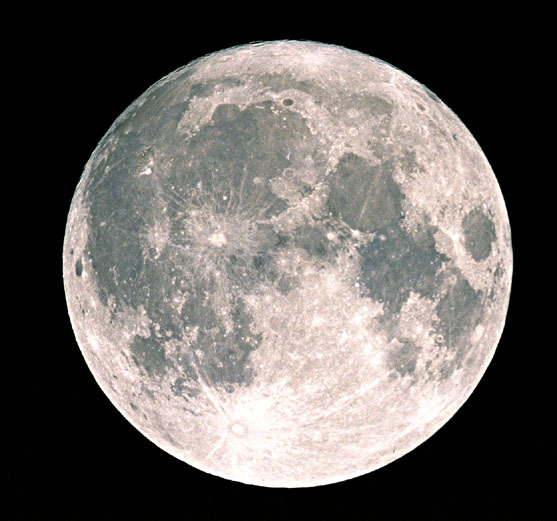 The full moon, taken using a Celestar 8 telescope as a 2000-mm f/10 lens. Kodak Elite Chrome 100 Extra Color film, 1/125 second. This picture reveals subtle color differences between different areas of the lunar surface; for instance, Mare Tranquillitatis is bluer than the other maria. 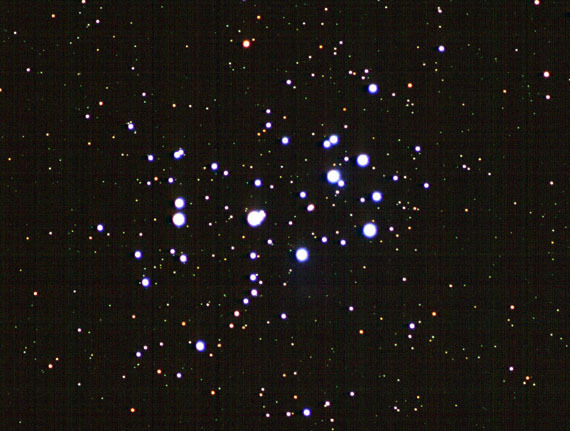 The Pleiades star cluster (known in Japanese as Subaru and used as the trademark of a car). Ten-minute exposure on Kodak Elite Chrome 200 with 300-mm f/4.5 lens wide open, mounted on motor-driven telescope. The Bay of Rainbows (Sinus Iridum) on the moon, using Ektachrome Elite II 100 film for fine grain and strong color saturation. This picture was taken by the afocal method. That is, the camera, with a 100-mm lens, was aimed into an 18-mm eyepiece on an 8-inch f/10 telescope. Exposure approximately 2 seconds, using a black card in front of the telescope as a shutter to minimize vibration. 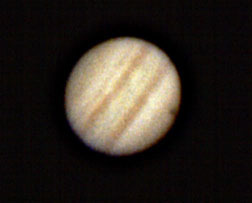 Jupiter, with the same setup as the previous picture. One-second exposure. Digital image processing helped bring out low-contrast detail as well as some film grain. The shadow of the satellite Io is visible on the planet at the lower right. 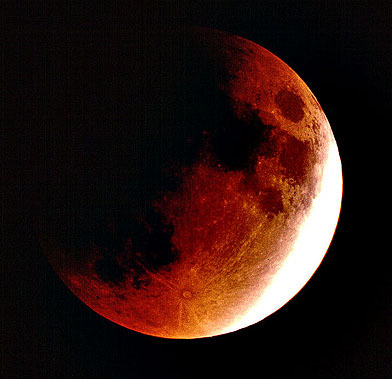 Eclipse of the moon, January 20, 2000. 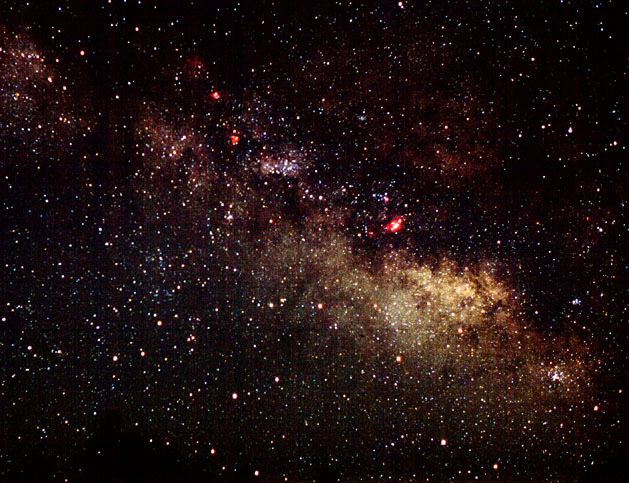 Four-second exposure on Kodak Elite Chrome 100 Extra Color, using a 5-inch Celestron telescope as a 1250-mm f/10 lens. 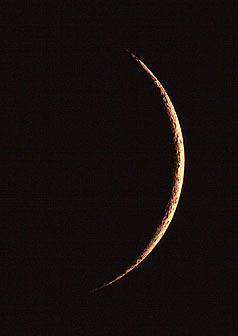 Very young moon, May 5, 2000, using a Celestar 8 telescope as a 2000-mm f/10 lens, 1/15 second on Kodak Elite Chrome 100 pushed 1 stop. Lunar craters near the Straight Wall (Rupes Recta), visible, mostly in shadow, below center. Kodak B+W Plus 400 chromogenic black-and-white film, digitally processed as a duotone (blue-cyan tint) to enhance appearance on the screen. 100-mm lens aimed into 18-mm eyepiece on 8-inch f/10 telescope for an effective focal length of 12,000 mm at f/60.